Here we are, almost ready to go to the horse races, and all I thought we needed was a cooler of ice and couple bottles of water and maybe a sandwich or two - just in case they weren't selling Belikin and rice and beans. What do we bring? A blanket to sit on, two pair of binoculars, napkins, potato chips, six tunafish sandwiches, bug juice, along with the cooler and the water. Apparently, we're still betting they'll be selling beer at least. Ok, I'll admit it. It is much easier and more comfortable to be prepared for contingencies. Except that now we're hauling along at least one more tote than we would have with my preparation scheme - which was to essentially do nothing - as men will tend to do. So, promptly at 10:30 AM, Doug and Twyla pulled up to our gate. We loaded our stuff in with theirs (they brought as much stuff as we did), and away we went. The race was to be held down at Burrell Boom Village, just off the Belize bypass. None of us had any idea of what to expect. In fact, I envisioned an open field, kind of like the horse races you might see in some cowboy movie - maybe a couple of stakes with flags or something. After making a couple of wrong turns on the bypass (following other cars) and after asking for directions (see, we can do it) we found the place. Wow! It's an actual horse track with an admission booth ($5.00 BZ per person and $2.00 BZ per car). Parking seemed to be adequate, so we parked. There was even a complimentary race day 20-page program to give you some information on the horses, owners, jockeys, etc. As we started heading in to the main area we could see several food and beverage vendors buildings and tents. There was even a grandstand. Here's where we had come to. 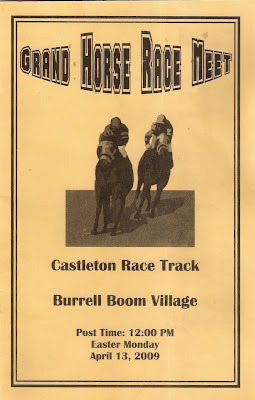 Castleton Race Track. A regular horse racing track, complete with stables, paddock, exercise yard, the race track, grandstand, restrooms ($1.00 BZ per), etc. Looking up and down the track just as we're approaching the main area. White marl track bed, with grass on the outside. One of the rather unique features here is the booze vendors, selling rum, wine and other spirits. Beer could only be purchased by the glass at the Belikin beer tent. If you weren't getting there fast enough, you could by a bottle of rum and speed up the process. I'm sure by the end of the last race, there were some who had a full head of steam. I'm glad we left early. We found the Belikin tent and cooled down with some ice-cold Belikins. No draft. It was all bottled beer served in plastic cups. At least you got a full bottles-worth in each cup. From the beer tent, you can see the stables where all the horses were resting, anticipating the coming races. It was probably a good thing too that there were plenty of police in evidence, patrolling the whole place. The main reason we came to the races, was to see a horse named General run. General is owned by Glenford, who had done some of the construction work for Doug and Twyla. Some more of the horses, waiting for the racing to get underway. This horse was quite impatient, pawing at the ground, obviously ready to go. After touring the horses, we stopped again at the beer tent... as you do. Then we headed back to Doug and Twyla's Isuzu for our lunch. After lunch, with the first race scheduled to start at 12:45 PM, we watched the horses being walked in the exercise area just across from the beer tent. We walked around a bit and found the starting gate. First time any of us had been up close to one of these. Quite the contraption. We walked over to the grand stand, where the track announcers were getting ready for the festivities, and looked over the grandstand. Seating in the stands cost $2.00 BZ per person - and you had to provide your own chairs! Love FM/TV was on hand with a couple of camera crews to capture the race excitement. It wouldn't be a horse race without a wager, now would it? Well, we never did find the official betting booths or whatever they're called for the races but, we did find several other games of chance underway, with substantial amounts of money involved too. Finally, it's paddock time. Here's General, getting his turn to show off prior to the race. Good looking horse. Glenford went with a slightly heavier jockey today because of his experience. He had a specific track he wanted the jockey to take General in for a better chance at a win. After the show in the paddock, the horses headed out onto the track to prance around and get warmed up. The starting gate had been moved over to the far side of the track for this first race, as it was 3 furlongs (a furlong being equal to 1/8th of a mile). And, they're off! A quick race and General won handily. Here he is crossing the line in good fashion. Second and third places came in close together. I was lucky enough to get shots of each as they passed by. G Class; 3 Furlongs; Entry Fee: $30.00 BZ; Value of Race: $300.00; Value to Winner: $150.00 ; Second Place: $90.00; and Third Place: $60.00. And it was a "Catch Weight" race - meaning that there was no penalty for a heavier/lighter jockey. Each race entry fee and purse went up. So, for the last race (there were nine races today), the entry fee was $200.00 BZ, with a purse for the winner of $1,000.00 BZ. Not a sport for those with a penurious outlook. Here's a wide view of just a part of the crowd. I'm guessing, but I'd say there was a crowd ranging from 750 to 1,000 people at the race. Quite a crowd. Sometime after the second race, we managed to run into Glenford and his son. After introductions, there was, of course, chatting about General, the track, and future races - of which, there's quite a few. Before the third race, it was getting time for us to seek shade for a bit. Here's Twyla and Dianna enjoying using a blanket to rest and refresh. Then we watched the third race. They ran so fast, all I got was a cloud of dust as the winner went by. By then, we were pooped out and it was time to go home. Luckily, as we reached Doug's Isuzu, a guy was just rooting around in the trunk of his car and was kind enough to move for us to get out. Otherwise, I'm sure we would have been stuck till well after the ninth race. And with all those bottles of rum, and Belikins being consumed, not a good place to be anywhere near at all. Doug and Twyla dropped us off at our place and we pretty well collapsed for the evening. What a great day. This was only our second horse race ever, the first being at Portland Meadows in Portland, Oregon. Which was boring, boring, boring - not at all like you find in the movies. I'll take horseracing in Belize any day of the week. Now that we know more or less what to expect, I hope we go again. Not to every race, but it would be great to make it to two or three a year. Very interesting. I had no idea that there is horse racing in Belize. Frankly, we didn't either, especially that it's as developed as it is, or that they have as extensive a racing calendar as they do. Overall, the whole thing really reminded me of a county fair back in the States. It was a lot of fun. I recommend going if you get the chance. that was a neat post! Thanks!! Thank you. It was fun to write as well as fun to be there. Great weather for it though. What is the GOB's position on parimutuel betting? Is it disallowed? I don't think you have casinos in Belize? George Hardie's Las Vegas Hote and Casino, Corozal Free Zone. I'll try to look it up. If I find anything, I'll post it in a future item.